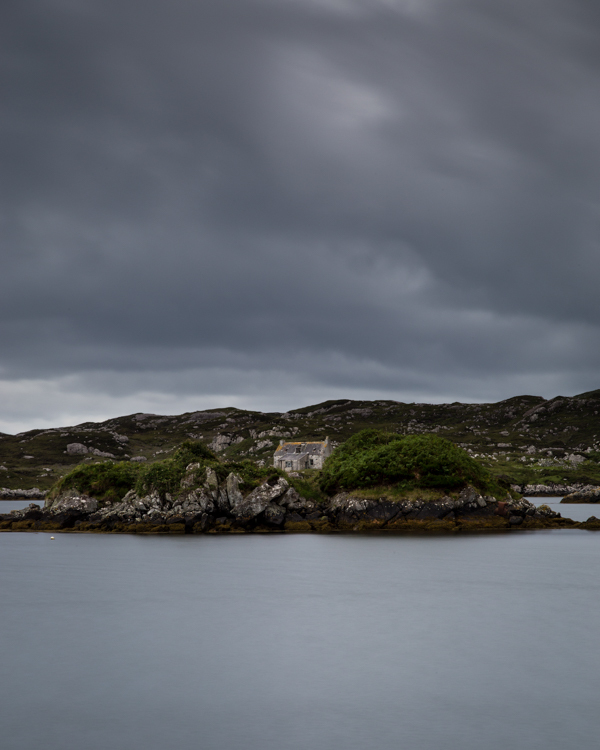 Trying to capture a sense of desolation and isolation I took this long exposure photograph looking across Lingerbay. Lingerbay lies on the east coast of the Isle of Harris, just off the Golden Road (so called because of the alleged cost of building it) some 12 or so miles from Leverburgh. The Golden Road is often over looked as a way round the Isle of Harris in favour of the faster and more immediately visually spectacular main road via Horgabost, Seilebost and Luskentyre where there are views across white sands and turquoise blue waters. The Golden Road via Lingerbay is twisty and windy, with rocky inlets and nothing that immediately catches the eye. It is a bleak place. LIngerbay rose to fame as there were plans to build a super quarry here, plans that were eventually quashed. All that remains are some crude landing piers (though nice and level for pitching a campervan for the adventurous) and a number of run down abandoned cottages and croft land. If you are taking the Golden Road, I would recommend a visit to The Mission House Studio and to The Harris Tweed Company. Thanks for getting in touch. Having read more about the Golden Road in the years since I did these posts I would agree. That said I think the challenge nowadays (as I have fallen victim to) is that most sources of information claim the road starts/ends in Rodel, propagated by official sites – such as Visit Outer Hebrides (https://www.visitouterhebrides.co.uk/our-islands/isle-of-harris/south-harris-and-bays) and many others including photographic tours of the area.